Signet has released the new editions of Your Buyer’s Guide August 2011 with price reductions across numerous categories and an additional 170 new products suitable to support business, commercial and industrial needs. The new Your Buyer’s Guide includes categories suited for manufacturing, warehousing, construction, agriculture, sporting field supplies, retail and household markets. After listening to customer feedback on needs and requests for products outside of Your Buyer’s Guide range, Signet has worked hard to source and fulfil these requirements in order to provide better and wider varieties for businesses and industries. The new sourced range will include new stationery products, safety glasses, tarpaulins, computer equipment, speciality tapes, aerosols and more. Your Buyer’s Guide August 2011 catalogue prices will remain secured until 31 December 2011, to provide flexibility in budgeting and ahead planning for businesses and industries. Signet are dedicated to ensure customers with easy and hassle-free processes, plentiful stock, on-time deliveries and competitive pricing. 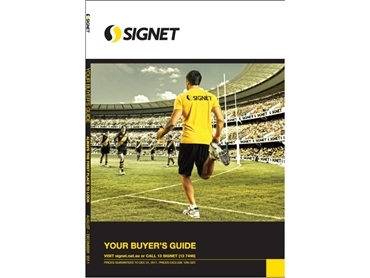 Signet also has the Your Buyer's Guide August 2011 available online.